One of the drivers where I work watched someone dump a kitten at the side of the road, so she stopped and saved it. It was a tiny tiny tuxedo baby boy. I have an irrational belief that cats find me. That every cat in my life is fated to be part of it. I’ve been mulling a second cat. I’ve had 2 cats my entire life until the last 5 years or so. Lily, my last cat, did not enjoy other cats and for awhile I was barely fit to take care of her so we were fine, just the 2 of us. 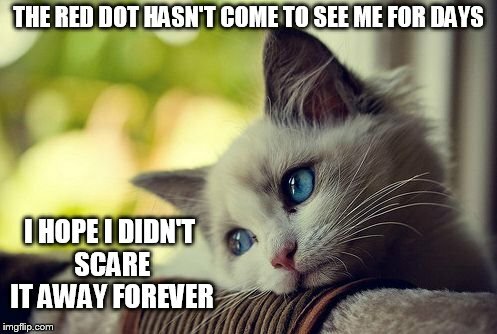 She died last summer and after a bit another cat arrived to fill the utter void that claimed my life when she left. Bijou. I was quite sure I was still too hurt about Lily and couldn’t take on another cat, and then someone posted on Tumblr that a local cat needed a home. That seemed like Bijou was supposed to be mine. I think Bijou is a bit lonely. And I feel quite guilty about this. But 2 cats is, in fact, twice as many cats. So I have been mulling and not doing much about it. So anyway, while I was dithering, the driver walks in with this kitten. A kismet kitten. So I offered to take it. But another driver was more excited and had recently lost his cat and had no cat, so in the end I didn’t bring home a tiny tuxedo kitten for Bijou. I don’t believe in fate. But nearly every cat I have taken into my life has been a sort of kismet of that nature. Even when I picked up a cat at a shelter 25 years ago, I was convinced that I was going get a gorgeous calico kitten, but this bossy brown tabby literally climbed up my arm when I reached in to get the calico. And he just kept climbing in my lap and pushing over the shy calico, who had no real interest in me. So I took him home. Chester picked me. I just showed up and followed his instructions on the matter. I suppose another cat will show up soon enough. I think a kitten will be the safest thing to blend into our home, but damn they are busy. It’s hard to guarantee to good meld if you introduce 2 adult cats to each other. In a big space it’s not as crucial, but we are going to be in a one bedroom apartment. It will be cozy. We must get along. But kittens. They are so adorable for like 20 minutes and then you realize – they require a lot of monitoring. Kitten proofing is necessary. That kitten walked around our office for 10 minutes, and tried to bite cords, nearly fell off a desk, and for about a minute we couldn’t find him at all until he emerged from behind a desk covered in dust bunnies. Tail high, jauntily walking around oblivious to any and all possible consequences. He really was adorable. Possibly Bijou would take on the mentoring role and keep a kitten in check. Well, we will see what fate brings. Not that I believe in fate. I don’t.